A wise friend is one who "rubs you the right way" and sharpens you as a friend and as a believer. Friends sharpen one another by encouraging, by exhorting and by empowering. We typically think of fear as a negative emotion or the antithesis of faith. But fear can create tremendous motivation for you. For example, a healthy fear of disobeying God can motivate you to obey Him. Late one night, a man had gone to a party and had too much to drink, so he decided it would be best to walk home. He found a shortcut through a poorly lit cemetery and, in the darkness, stumbled into an open grave. He tried to climb out but the walls were too slippery. Again and again he fell back into the grave. Finally, in exhaustion, he settled in a corner to wait for sunlight. A few minutes later, another man in the same condition was cutting through the cemetery and fell victim to the same grave. He, too, tried desperately to climb and claw his way out, and he was equally unsuccessful. As he was about to give up in hopeless resignation, he heard a voice from the darkness of his pit: "You may as well give up. You’ll never get out of here." Remember learning to ride a bike or the first time you jumped off the diving board? You no doubt found the courage from the coaxing of a parent assuring you, "Come on! You can do it! I'm right here! I will help you!" The four words, "You can do it!" or "I believe in you!" from a significant person have amazing power in the life of another! By means of your faith you can speak faith into another! You can believe in them and for them until they are able to believe themselves. You will do things for love that you woudn't do for money. That is the power of love! Who would ever change a dirty diaper except for love? Who would ever go to war except for love of country and love of freedom. Love inspires and emboldens and empowers both the one who loves and the one loved. Sometimes the love that empowers is tough love! I had to give my grandson some tough love and call him out in a certain area. Though it was a little hard for him to hear, he received it and made some changes. Later, he even thanked me for challenging him and asked me to continue calling out the best in him. I will! I love him! He will continue to receive it! He loves me! Wisdom forms a firm foundation for friendship because it encourages and it exhorts and it empowers. It seems that a young woman went to her mother and told her about her life and how things were so hard for her. She did not know how she was going to make it and wanted to give up. She was tired of fighting and struggling. It seemed as one problem was solved a new one arose. In about twenty minutes she turned off the burners. She fished the carrots out and placed them in a bowl. She pulled the eggs out and placed them in a bowl. Then she ladled the coffee out and placed it in a bowl. Turning to her daughter, she asked, "Tell me what do you see?" "Carrots, eggs, and coffee," she replied. She brought her closer and asked her to feel the carrots. She did and noted that they got soft. She then asked her to take an egg and break it. After pulling off the shell, she observed the hard-boiled egg. Finally, she asked her to sip the coffee. The daughter smiled, as she tasted its rich aroma. The daughter then asked. "What’s the point, mother?" One reason I have chosen to spend a few days in this Psalm is because the Psalms deal with the gamut of emotions that you and I face in everyday life! This Psalm, for instance tackles discouragement in a very true and transparent manner. In the dangerous and difficult world where we live, you can easily become discouraged. You may be discouraged by someone else, you may be discouraged by yourself or you could be discouraged by God - or even all three! 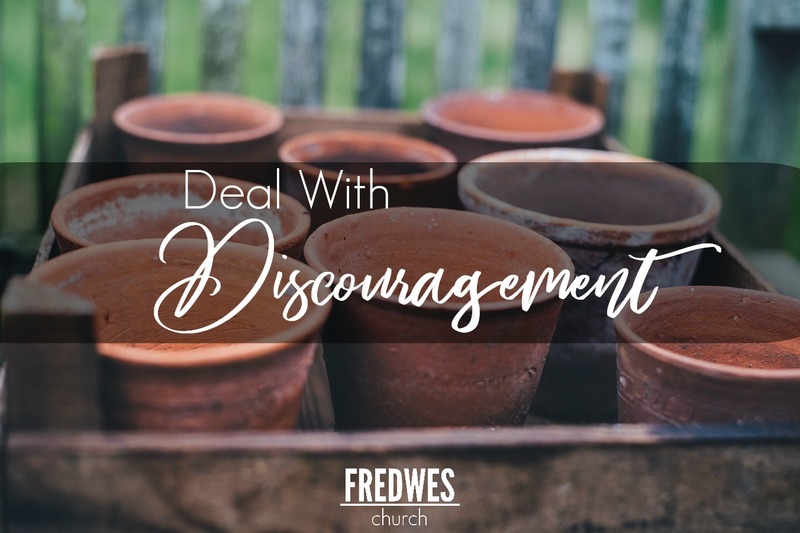 So, how can you deal with discouragement in a way that changes the water? Discouragement is a big tool in the enemy's arsenal and he will attack you with it early and often. He intends to use it to cause you to feel like giving up. If you don't handle it it can lead to depression. But, if you learned to handle discouragement and learn to use it to draw closer to God, the enemy will be less likely use it against you! So, if he tries to use that one weapon against you I have given you five to defend yourself with!